The Executive Council of Australian Jewry chose to respond to the advertisement of Meat and Livestock Australia. We bring you that response along with the reply of the Brand Manager of Meat and Livestock Australia. I refer to your recent television advertisement encouraging Australians to consume lamb. 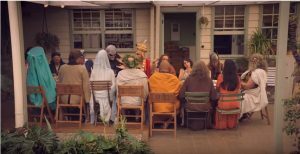 The advertisement depicts the most revered figures and deities of some of the world’s major religions sitting at a dining table where a meal of lamb is being served. The advertisement is presumably intended as a humorous way of conveying a message that everyone in Australia, for all its multicultural and religious diversity, can enjoy eating lamb. As you have since been made aware in various media articles about the advertisement, that message is factually inaccurate. For example, the advertisement portrays the Hindu God Ganesh, whose followers are under a religious prohibition against eating meat. They are strictly vegetarian. However, factual inaccuracy is not the major flaw of the advertisement. Humour can be a fine and powerful tool in advertising, but using humour to “take the piss” out of people’s most sacred and cherished beliefs (whether those beliefs relate to religion, Australia Day, Anzac Day, or anything else) reflects poorly on your organisation, especially when humour is used in this way as a marketing tool for commercial gain. You cannot have been unaware of this, as the advertisement expressly devises a way to avoid depicting Islam’s main prophet, Muhammad, whose portrayal is forbidden by Islam. One of the characters in the advertisement refers to “you lot and your dietary laws” – presumably a reference to Jews. Many Jews would find the coarseness of the reference to be derogatory. It is certainly not the right way to convince Jewish consumers to buy a product. I urge you to reconsider, and withdraw this insensitive advertisement. It was no doubt meant to be amusing, but badly missed its mark. Thank you for providing feedback on the latest Spring Lamb campaign. The “You Never Lamb Alone” campaigns have promoted the value of unity and inclusivity for many years and this latest instalment of the campaign is no different. To clarify the line used in the content is “you lot and your dietary requirements”, and was included to recognise the various dietary differences, both religious, non-religious and health-based, that exist in the Australian community. It is a generic and all-encompassing line and is not directed at any particular group or religion. Our intent was never to offend, but merely acknowledge that Lamb is a meat consumed by a wide variety of cultures.